5 chubby samurai, 2 tired beehives, 3058 glass eyes, 12 rapping puffer fish, 5 leaf blowers, 4 ghosts... and 1 skunk! In another fun-filled collaboration with WCRS and director, Mitch Stratten, we've created eight very weird and wonderful MINI Countryman sponsorship idents for The Jonathan Ross Show on ITV1. Mitch, with whom we have previously worked with on the record breaking Toshiba 'Time Sculpture', was meticulous in his approach - always challenging and with immense attention to detail. Mitch's expertise is in live action and consequently this was one of his biggest CG jobs yet, so it was our goal to make the CG 100% photoreal and believable. 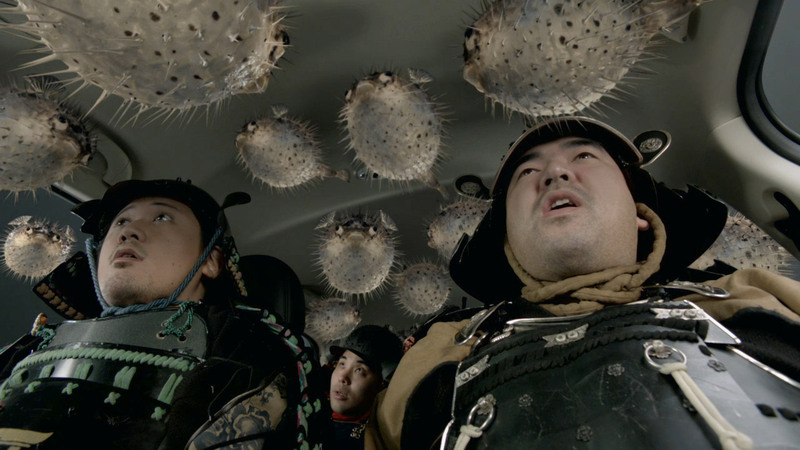 Well, as believable as a puffer fish rapping and thousands of eyes rolling into a MINI can be! VFX Producer, Rahel Makonnen recalled "Due to the practical way in which it was filmed it was a very enjoyable 2D comp job. The 3D elements involved were a challenge but we're very pleased with the end result. All of the creatives at WRCS and Mitch have a great sense of humour and it was a pleasure for the whole team to work on such an extraordinary concept."